The City Palace in Jaipur is still resided by the descendants of the ex rulers of the city. The palace, like many other palaces of Jaipur, has been converted into museums and galleries displaying artifacts from the medieval periods. With its splendid architecture and collection of interesting artifacts, the City Palace is one of the most notable tourist attractions of Jaipur. Tourism in Jaipur remains incomplete without a visit to this beautiful palace in the capital city of Rajasthan. The City Palace was built by Maharaja Sawai Jai Singh. The outdoor walls and basic structures built during his reign were later added to by subsequent rulers to give shape to the present day palace. The vast area of the palace includes well maintained gardens, courtyards and magnificent buildings. The major buildings of the palace include the Chandra Mahal, Badal Mahal, Mubarak mahal, Maharani’s Palace and the Mukut Mahal. Some areas of the museum have been converted into galleries, while the Maharani’s mahal, the residence of the queen has been converted into a museum. 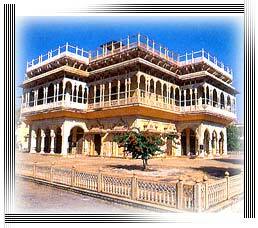 Chandra mahal is the most beautiful building inside the palace complex. It has seven stories, each of which has separate names. The topmost storey is called Mukut Mahal, which is used by the present day royalty for their residence. The interiors of these buildings are richly adorned with paintings, sculptures and other works of art and even today, preserve the ambience of the bygone days of Royal splendor. The Diwan-i-am, and the Diwan-i-khas, the halls for public and private audience respectively, are the other major structures within the palace. The private hall, in addition to beautiful architecture, stores two huge silver vessels which were meant to carry water from the Ganges for Maharaja Sawai Madho Singh II during his trip to England. The museums and art galleries are the most interesting places in the palace. The diwan-i-am has been converted into an art gallery which displays impressive works from the traditional schools of painting in Rajasthan, and many handwritten manuscripts held in importance by the historians. The Mubarak Mahal was originally used as a guest room by the kings. Today it is a costume gallery that displays a large number of royal attire. The City Palace also has the Sri Govind temple, which is a grand structure in itself. A restaurant within the complex offers a wide range of culinary delights, a perfect addition to the tour of the palace.